Vessels at South Side Marina, Providenciales. The South Side Marina is a popular destination for cruisers. South Side Marina is a small harbour located on the central south coast of Providenciales in the Turtle Tail area. This complex is found inland a short distance, with connection to the Caicos Banks by a dredged channel. The network of canals in the Cooper Jack Bay and Discovery Bay areas begin here as well. 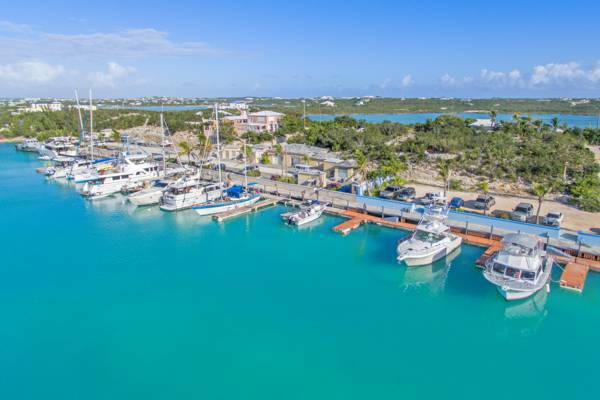 This quiet marina is a favourite with cruisers, as slip and service rates tend to be a little better than what’s typical at the larger Providenciales marinas. Also on site is Bob’s Bar, a small pub that offers an old time Providenciales atmosphere, and is likewise a perfect place to grab a refreshment and watch the sunset. Pot luck events and BBQs are also hosted weekly. South Side Marina offers friendly services and a great location. South Side Marina is a port-of-entry, and offers fuel, water, electricity, self-service laundry facilities, ice and Wi-Fi. Gasoline, diesel, and 2-stroke engine oil is available, as well as electricity, fresh water, and ice. Two local dive and boat charter companies, Caicos Adventures and Aqua TCI, operate out of South Side Marina, with excursions to the incredible dive sites of Northwest Point, West Caicos, and French Cay. Slips of varying size, and docking for tenders is available. Slip fees start at $50 per day for daily rates, with discounts for longer periods. Vessel storage and lift-out services are also provided. As is the case with many of the marinas and cuts surrounding the Turks and Caicos, care should be taken with navigation into South Side Marina. At lower tides, the banks surrounding the inlet into South Side Marina can be quite shallow, and vessels may become grounded if they stray off course. We advise contacting the marina prior to entry on VHF Channel 16. If you’re looking to simply refuel and restock, and then find a great place to moor, there are two sheltered sites within an hour’s sail. 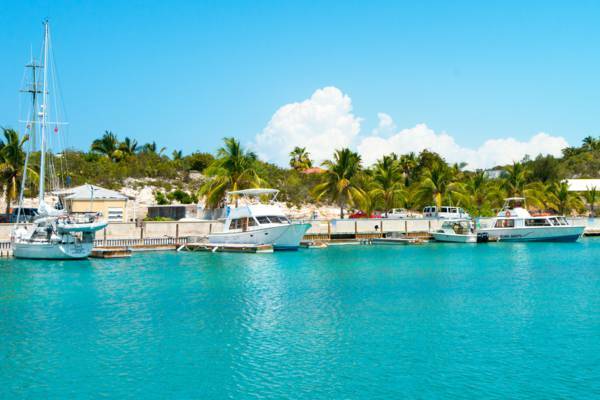 A popular spot is at Sapodilla Bay, found a 5 mile (8km) sail to the west. This cove offers a great and tranquil beach. Another option is to anchor in the lee of the cays off South Dock and Five Cays. These small islands include Bay Cay, William Dean Cay, and Pusey Cay. Providenciales offers a great selection of amenities and services. There are supermarkets, water sports and marine shops, restaurants, medical services, building supplies, and mechanics and machinists. Rental car rates on Providenciales tend to be the lowest in the country, and economy cars can be found for under $50 per day. There’s no public transport and taxis are quite expensive, so having a car is the best way to get around. Last reviewed by an editor on 15 February 2018.